This is some of Stephen's boldest and most direct writing. Based on the Universal Spiritual Truths, or the deeper levels of spiritual understanding, it presents a new code in a completely nonsectarian way that anyone should be able and willing to follow. We all know of the basic ten commandments which deal mostly with moralistic principles, but here is the Eleventh Commandment that will surely supplant the previous ones and provide a truly spiritual dimension to everything we do. It increases our awareness of the spiritual nature all around and within us. 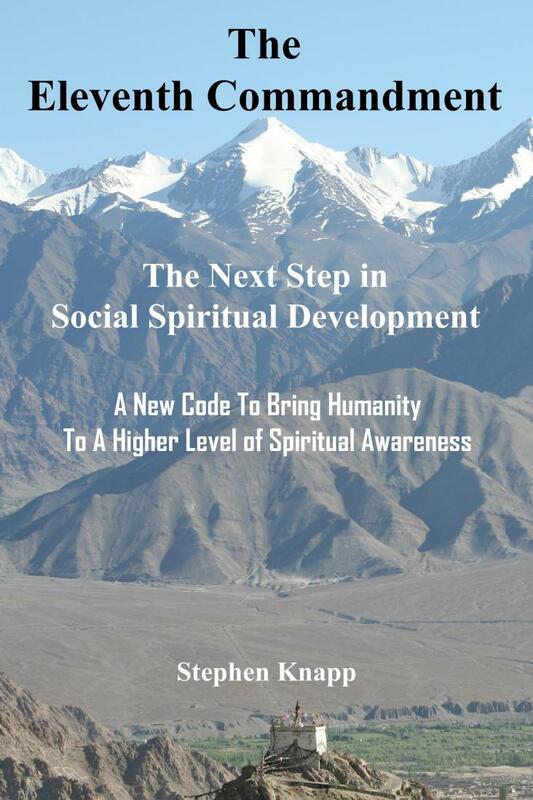 Anyone from any background who wants to advance in their spiritual perception needs to seriously study this new code and its deep ramifications that it expects for society to change and grow. This will lift everyone to become a more refined and civilized human being. Society has been evolving for many years, progressing to the degree that its particular knowledge, understanding, and perception allow. Many people are ready and anticipating the next step in the spiritual progress of the planet that could uplift the whole society and bring a new level of peace and understanding to the world. From the various religions that are available, we have acquired certain spiritual codes and rules that we have chosen to live by, and that we have used as tools to guide us, and they have served us well. However, most would agree that there is a need to enhance humanity’s progress, even if it takes new insights and principles to add to what we already have, or even to supersede those codes that no longer provide the necessary clarity for a sharper spiritual perception and more refined awareness. Thus, this new code expects us to sophisticate ourselves to a higher level of civility, to a new dimension of activity, and to adopt progressive changes beyond what we had followed in the past. But it must be understood that its purpose is to assist us in acquiring a higher degree of spiritual perception and personal realization and development. Herein is the next step for consideration, which can be used as a tool for guidance, and for setting a higher standard in our society today. This can be used by anyone from any background or culture, and easily suites an interfaith dialog to propel humanity at large toward a closer spiritual unity with each other and with God. With this new principle, we can easily instill within our social structure a mutual respect for one another and a universal understanding of what we are and the spiritual similarities that we all share. The new realizations and vision that we need to attain, in order to achieve this goal, will then become apparent to us. This new commandment expects and directs us toward a change in our social awareness and spiritual consciousness. It is conceived, formulated, and now provided to assist humanity in reaching its true destiny, and to bring a new spiritual dimension into the basic fabric of our ordinary every day life. It is a key that unlocks the doors of perception, and opens up a whole new aspect of spiritual understanding for all of us to view. It is the commandment which precepts us to gain the knowledge of the hidden mysteries, which have for so long remained an enigma to the confused and misdirected men of this world. It holds the key which unlocks the answers to man’s quest for peace and happiness, and the next step for spiritual growth on a dynamic and all-inclusive social level. This is a ground-breaking new code to bring humanity to a higher level of consciousness, and to increase the spiritual awareness of society. When taken to heart, it can change the way we see and interact with each other on numerous levels. It brings us to the stage of understanding that humanity is responsible for its own spiritual maturity and that it is time to manifest a more elevated civilization. This new commandment instructs us how to alter our often superficial views that we have of ourselves and each other, and bring us to a deeper level of perceiving our spiritual identity and similarities we have among us all. This can transform us in a way that will help us reconsider how we engage in business, politics, take care of the environment, adjust our diet, and give attention for all beings. It also shows how society must recognize our spiritual likenesses in order to have more respect for one another and, thus, bring about real peace in the world. · Identify our real Self and distinguish it from our false self. · Open our hearts to one another and view others with greater appreciation. · Utilize higher consciousness in everyday life. · Find inner contentment and joy. · Attain a higher spiritual awareness and perception. · Manifest God’s plan for the world. · Be a reflection of God’s love toward everyone. · Attain the Great Realization of perceiving the Divine in all beings. The world is in need of a new direction in its spiritual development, and this 11th Commandment is given as the next phase to manifest humanity’s most elevated potentials. Society has been evolving for many years, progressing to the degree that its particular knowledge, understanding, and perception allow. Many people are ready and anticipating the next step in the spiritual progress of the planet that could uplift the whole society and bring a new level of peace and understanding to the world. From the various religions of the world, we have acquired certain spiritual codes and rules that we have chosen to live by, and that we have used as tools to guide us, and they have served us well. However, most would agree that there is a need to enhance humanity's progress, even if it takes new insights and principles to add to what we already have, or even to supersede those codes that no longer provide the necessary clarity for a sharper spiritual perception and more refined awareness. Thus, this new code expects us to sophisticate ourselves to a higher level of civility, to a new dimension of activity, and to adopt progressive changes beyond what we had followed in the past. But it must be understood that its purpose is to assist us in acquiring a higher degree of spiritual perception and personal realization and development. This new commandment expects and directs us toward a change in our social awareness and spiritual consciousness. It is conceived, formulated, and now provided to assist humanity in reaching its true destiny, and to bring a new spiritual dimension into the basic fabric of our ordinary, every day life. It is a key that unlocks the doors of perception, and opens up a whole new aspect of spiritual understanding for all of us to view. It is the commandment which precepts us to gain the knowledge of the hidden mysteries, which have for so long remained an enigma to the confused and misdirected men of this world. It holds the key which unlocks the answers to humanity's quest for peace and happiness, and the next step for spiritual growth on a dynamic and all-inclusive social level. PAPERBACK: $9.95, Size: 6" x 9", Pages: 154, ISBN-10: 198601004X, ISBN-13: 978-1986010047. AVAILABLE AS PAPERBACK OR KINDLE EBOOK AT ALL OTHER AMAZON LOCATIONS IN LOCAL CURRENCIES.